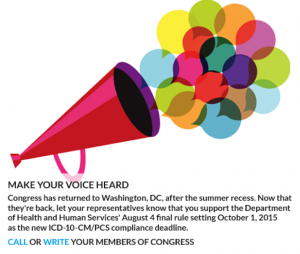 By now you may have heard about a new initiative that AHIMA has initiated surrounding the implementation of ICD10. On April 1, President Obama signed H.R. 4302 that effectively delayed the implementation of ICD10 to no earlier than October 1, 2015. On August 4, 2014 the US Department of Health and Human Services published a rule finalizing October 1, 2015 as the new compliance date for health care providers, health plans, and health care clearinghouses to transition to ICD-10. Many of us were disappointed that there was yet another delay in the implementation of a classification system that is long overdue. There is a fair amount of skepticism, that the new date of October 1, 2015 will be one that is adhered to. In order to insure that ICD10 implementation is achieved by the new compliance date, AHIMA has initiated the ICD10 Grassroots Campaign. Meet with (in person or via phone) all 435 House Representatives and all 100 members of the US Senate by December 31. Members of LHIMA are being asked to reach out to the representative who represents their district and both members of the Senate. The goal is that every member makes at least one telephone call, and sends one letter to our congressional representatives. AHIMA has developed tools, templates and information about your representatives to make this an easy task to accomplish. These tools can be found in the AHIMA Advocacy page on the AHIMA website. Please access the following link and review the site to gain additional information regarding this campaign. In addition, use the links in the following announcements to find out the three representatives associated with your zip code. On the advocacy page there will be talking points, letter templates and a host of other materials to assist you. I am available to assist in any way I can. If you have questions about the process, do not hesitate to contact me at iosi@ochsner.org. As you contact your various representatives, please cc me or send me a note that you have made contact. I am tracking our state membership’s involvement in this campaign. I would like to thank everyone in advance for your support of this critical campaign. We can make this happen!